First of all, Happy Thanksgiving to all U.S. ribbon lovers! I hope you are enjoying time with friends and family today! If you have time for some crafting, maybe you can try this easy ric rac flower! Step 1: Cut your ric rac in two lengths. I used Light Pink and cut two lengths of 20 inches each. I twisted them together every so often and sewed along one edge with my sewing machine. If you don't sew, you could use liquid or hot glue. Step 2: Start rolling up your flower from one end, adding dots of hot glue every so often. Step 3: Tuck the end underneath and glue to the bottom. You will have a little rosette! I wanted more of an open flower, so I spread out all of the "petals." Step 4: I cut a small circle of matching felt and hot glued it to the bottom of the flower. Step 5: Using a coordinating color of felt, I cut two leaves and glued those to the circle. I attached the flower to my card using Scor-Tape. And voila! I added a row of the same ric rac along the bottom and added a flower button and some string. My sentiment is by Technique Tuesday and the designer paper is from the Everyday Eclectic Collection by Echo Park. There are a lot of beautiful ric rac colors in the RRR Store HERE. At a cost of about 30 cents for this flower (as opposed to much more pre-made in stores) you can make a whole garden full! You could add a clip and make this a hair accessory, or attach it to a headband too! Thanks for stopping by. I hope you will give this a try! Just beautiful. Thanks for the tutorial. Thank you for the great tutorial and beautiful card, Judy! It's absolutely beautiful Judy. What a great idea. 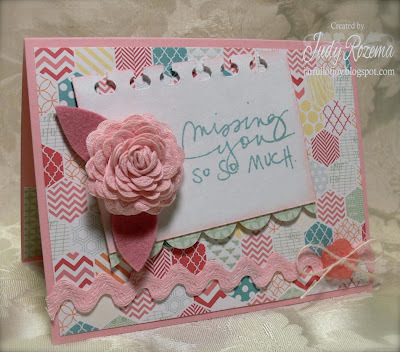 What a beautiful ric rac flower and card Judy! Thanks so much for sharing how you made it. Happy Thanksgiving to all! thanks for the share on the deets, adding to my bucket list. This is such a delightful card! Love how you've created this flower!